This is a three bedroom villa 90 m2 with jetty, a private swimming pool, terrace with garden furniture, barbeque and garage. Inside villa there is a livingroom with dining area, double sofa bed and TV. This is a six-room house on 2 levels, built in 2009. Is located 3 km from the centre of Calonge and 5 km from the sea. 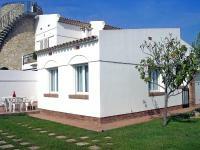 This is a six room terraced house 80 m2 on 2 levels, 200 m from the sea. There is a living room with open fireplace, dining table and TV (flat screen TV) and an exit to the terrace. This is a simple semi-detached house. In the district of Pení, 1. This is a simple semi-detached house. In the district of Pení, 1 km from the sea, located by a road. This is a semi-detached house with communal pool 30 meters away. It has a kitchen, 3 bedrooms and 2 bathrooms.